This article originally appeared in the 11/12/13 edition of the Tooele Transcript Bulletin. TOOELE, Any given day in 1968 – A young disc jockey sits in a small radio studio at the corner of Main and Vine, sorting through a stack of vinyl records. The station’s reel-to-reel automation block has ended and it’s time to go live. He unscrews the side of the massive belt-driven turntable, adjusts the gear speed and cues a Hank Snow track. When he drops the needle, Tooele Valley is bathed with the lo-fi sounds of classic country music. The station is KDYL 990 AM, “The Country Gentleman.” The fledgling DJ is a high school student from Salt Lake City by the name of Doug Wright. At age 16, Wright also serves as program director, news reader and janitor for the bare-bones, 1 kilowatt operation. Being more of a rock and roll guy, he’s not particularly keen on the station’s country format. But he’s obsessed with radio—and that is all that matters. 45 years later, Doug Wright is a mainstay at KSL Newsradio in Salt Lake City, and one of the best-known radio personalities in the business. He sat down last month with the Transcript Bulletin to reflect on his radio career and its humble beginnings in Tooele. Wright’s first turn behind a radio microphone, a volunteer gig at the University of Utah’s KUER, came when he was 16 years old. After only a few months spinning records there, he set out to begin his commercial career. “At that age you think you own the world and you think you’re a whole lot better and hotter than you are, and I just couldn’t understand why anybody wouldn’t hire me on a commercial basis,” Wright laughed. After failing to find work in the Salt Lake area, Wright turned his focus westward to Tooele’s KDYL. Relatively little has been documented about the early history of Tooele’s only long-lived radio station. In fact, commercial radio amounts to only a side note in Tooele County history. For most Tooele County residents, clear signals pouring in from stations in the Salt Lake market were local enough. But that fact didn’t foil a significant run for Tooele’s AM station. KDYL Tooele began airing in 1955 with the call sign KTUT, originally broadcasting from the Ritz Theater on Main Street. The station was renamed re-branded KDYL in the mid-1960s and was purchased by Wendell Winegar, who moved it across Main to the building that now houses the LA Hispanic Market at the corner of Vine. The cascading diamond shaped outlines of the letters K, D, Y, and L are still visible on the south face of the building. The studio itself was located on the second floor in the southeast corner. The station’s 200 foot tower still stands in a field at 600 N. 400 W. The station switched from middle-of-the-road (MOR) programming to country in 1966. The late 1960s marked a period of transition and mild upheaval for KDYL. According to Wright, when Wright came calling in 1968, only the General Manager of the station remained. Together, Hall and Wright operated the small-town station using equipment that seemed ancient to Wright at the time. “It was a great, great old station and everything was hand-me-down. We used to just keep that place together with spit and bailing wire,” Wright said. KDYL was a daytime station broadcasting between sunrise and sunset, with Wright at the helm as often as his schedule allowed. He commuted each day from Sugarhouse in his mother’s 1960 Plymouth. Because his pay at KDYL was negligible, he financed the commute by working a part time job at a Salt Lake grocery store. The station’s Schafer 800 reel-to-reel automation system allowed Hall and Wright to fill in parts of the day. The format was country music, which Wright said was mainly geared to the adult population. KDYL hosted weekly live show on Saturday mornings called “Country Jamboree” (or Country Jubilee—neither Wright nor Winegar could remember exactly), which featured local artists. A block of Spanish language programming ran on Sunday. For several years, KDYL covered Little League baseball games. Surplus speakers from the Tooele Army Depot were installed on light posts along Main Street so listeners out and about could hear the coverage. Wright remembers providing live coverage of a parade on Main Street by stringing a microphone through the roof of the building. “It was a mishmash of things. It was an eclectic place,” Wright smiled. Hall and Wright integrated news into the programming where possible, but since a traditional news wire service proved too expensive, they occasionally lifted stories from newspapers (including the Transcript Bulletin). Even so, Wright remembers the particularly jarring experience of going to a murder scene near the Tooele Post Office to gather details on the crime, then breaking into programming to provide updates over the air. Particularly memorable to wright was the need for careful timing—especially when it came to the Tooele Valley Railroad, which used to run down Vine Street. In time, Winegar allowed Wright to break format on Saturday afternoons to play rock and roll. This, according to Wright, was refreshing to younger listeners who began to visit him in-studio on Saturday nights. He maintains friendships with many of them to this day. Wright paused to point out that despite his initial aversion to the country genre, he acquired a taste for it while at KDYL. “I used to joke with my friends, saying all I do out there is play Hank, Hank, Hank, and Hank. Hank Locklin, Hank Snow, Hank Williams, Hank Jr. But it got in my blood,” he said. It was also during his time at KDYL that Wright became fascinated with mining history. 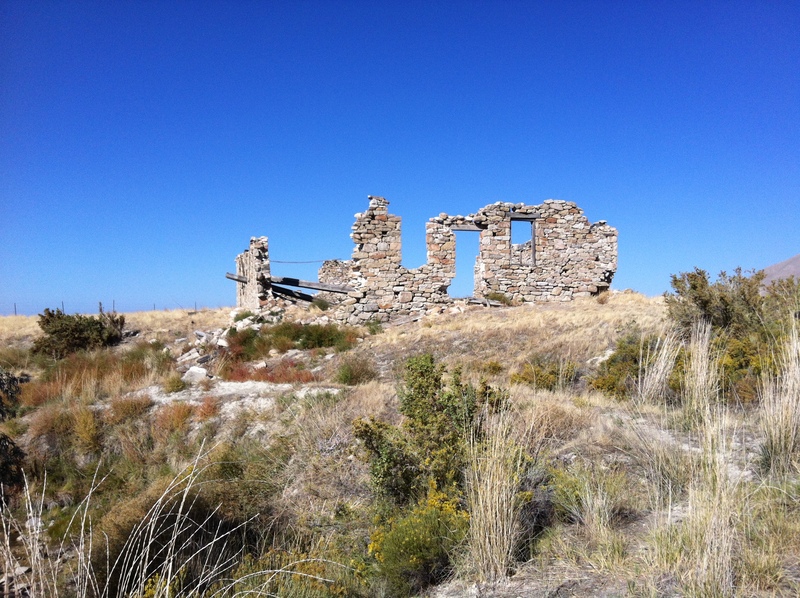 After signing off the air, he would frequently take excursions to local ghost towns and historic sites. While venturing further south into Juab County with a girlfriend from Tooele, he fell in love with the small town of Eureka and later bought a home there. After about a year at KDYL, Wright returned to the Salt Lake market, finally landing at KSL in 1978. Originally working as a fill-in host, he became Program Director and began hosting his own show. The Doug Wright Show airs from 9:00 to noon on weekdays. According to KSL Program Director Kevin LaRue, Wright’s show is heard by some 50,000 listeners each day. Winegar sold the station in 1979 and KDYL continued broadcasting as such until 1982 when it released the call sign to a Salt Lake station, assumed call sign KTLE, and switched its frequency AM 1010. The station switched ownership and formats several more times until 2009, when it was purchased by IHR Educational Broadcasting. The station, now KIHU (for Immaculate Heart Utah), broadcasts Catholic religious programming. But channeling Mark Twain, he posited that the reports of radio’s demise have been greatly exaggerated. It must adapt and evolve, but the need for local radio will always remain. Last week the Tooele Transcript Bulletin reported that the staff of the historic Benson Grist Mill in Stansbury Park had been laid off due to county budget woes. According to the piece (the online version of which is behind the TTB’s pay wall), the mill complex will remain closed for a 30-day “timeout” period, during which the Tooele County Commission will decide its fate. The mill’s temporary closure and uncertain future are alarming to those of us with a passion for Tooele County history, especially those who so diligently restore it from shambles in the 1980s. I haven’t spoken directly to County Commissioner Shawn Milne about the mill, but I gather he understands the site’s historical value and will do his best to see that it re-opens under capable oversight. 1. Private ownership means tax dollars can be used elsewhere. 2. The mill plays a major role in LDS Church history in the county. It was built in 1854 by LDS apostle Ezra Taft Benson to serve the predominantly LDS population of the region. The construction of the mill and the relics surrounding it (including the ruins of the Grantsville Woolen Factory) are archetypical of classic Mormon Pioneer architecture. Who better to care for these old structures than the organization that originally built it, and whose heritage it so perfectly encapsulates? 4. Archaeology. The mill and surrounding structures are an archaeological treasure trove. For everything you see above ground at that site, there’s triple that underground. Tooele County never had the resources to fund true archaeological research at the site (example: in 2008 a portion of the original miller’s residence was accidentally unearthed by a Stansbury Park maintenance crew. A photo or two was taken and the site was promptly paved over). The LDS Church, however, has a full archaeological arm. 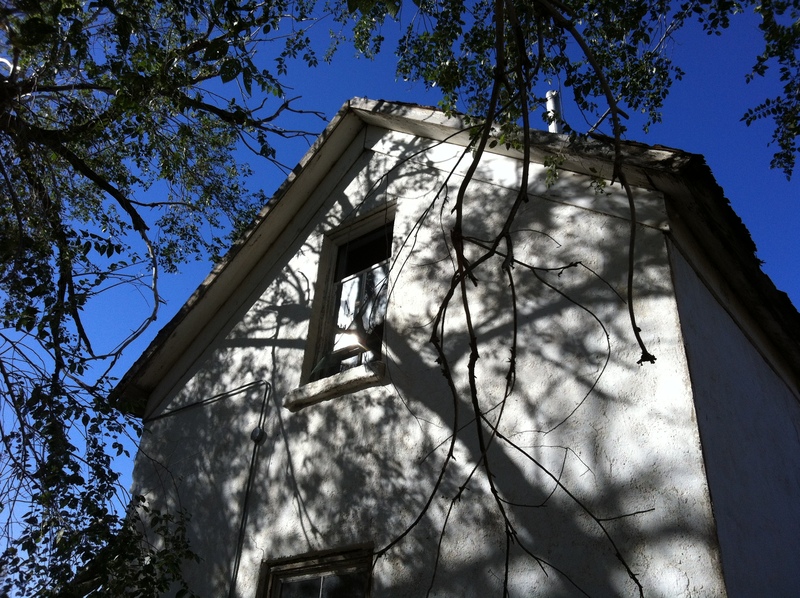 The mill has been dubbed the most significant historical structure in western Utah. Just imagine what lies beneath! I don’t know whether or not the County Commission has approached either Stansbury Park or the LDS Church about taking ownership of the mill, and these are just my initial thoughts spurred by Milne’s Facebook Post. But I’m obviously concerned about the mill’s future, and given the two choices, this is the best way to go. What are your thoughts? Commissioner Milne’s Facebook question was posed specifically to Stansbury Park residents, but I’m sure the Tooele County Commission would appreciate your thoughts regardless of where you’re from. Contact them via their website here. I’ll post updates as I learn them. The following originally appeared in the October 9, 2012 edition of the Tooele Transcript Bulletin. If you drive the northern stretch of SR-36 with any regularity, you’ve seen the remains of that old stone building. That’s right, the picturesque, castle-like edifice off the highway’s west side, about a mile north of Stansbury Park. Chances are it catches your eye most every time you pass it. And even if you’re not a history buff, chances are you spend at least a moment of your commute wondering about it. It’s got to be old, you tell yourself — pioneer era probably. But what was it? Who built it? And why was it abandoned? Every old building has its story, and the Grantsville Woolen Factory is certainly no exception. Situated near the Benson Grist Mill in the historic heart of Tooele Valley, the 143-year-old building is one of the county’s most significant cultural treasures. But like the structure itself, the factory’s story isn’t completely intact. The factory was a product of pioneer ingenuity in an era of extreme independence, when Mormon leaders encouraged pioneer communities to become as self-sufficient as possible. In the early 1850s, LDS Church President Brigham Young began counseling towns to build woolen factories. By 1857, several factories had been established in Salt Lake and Utah valleys. The most notable was the Provo factory, which was the largest woolen factory west of the Mississippi River. Young brought the same counsel to Tooele Valley in 1867 when he encouraged a Grantsville congregation to improve their sheep breeds by building a factory of their own. Construction of the Grantsville Woolen Factory began the next year, financed by several prominent Tooele County citizens. The building was located in old E.T. 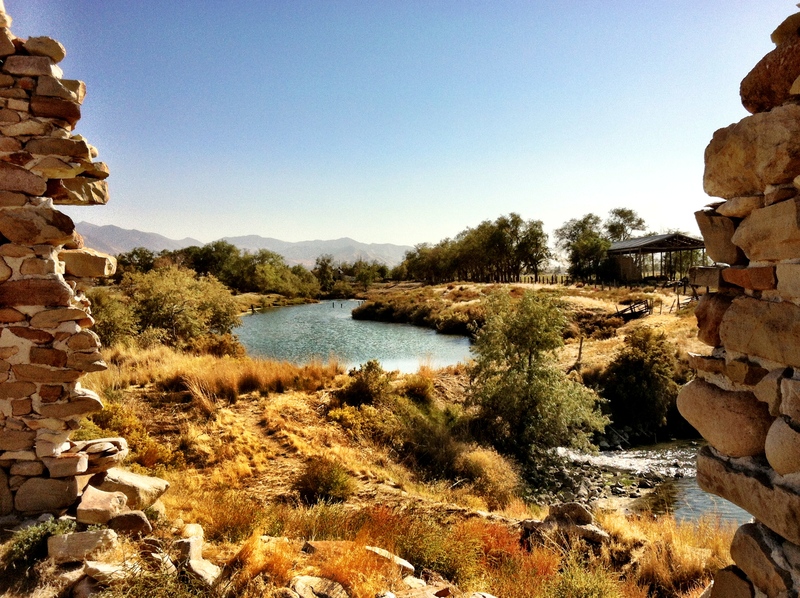 City along Adobe Rock Creek, a sizable waterway fed by a network of brackish springs. Bishop John Rowberry was president of the company, with James Wrathall as factory superintendent and John Forsyth as machinery consultant. Various staff, including Forsyth, settled at the adjacent Lone Rock Ranch across from Adobe Rock. The one and a half story factory measured 49-by-89 feet. Its walls were constructed of fitted blue limestone boulders cut from the nearby Oquirrh Mountains. Its upper room featured louvered windows and was supported with thick beams hewn from Oquirrh timber. It was accessed via two outside staircases. Twenty-five large windows on the lower story facilitated natural lighting, and machinery would be powered by a dam built across the creek. The Deseret Evening News reported that the building’s completion was marked on Aug. 20, 1869 by an epic, all-night party featuring talks from local leaders, a substantial supper and dancing. Music of excellent quality and in any desired quantity was provided by bands from Tooele and Grantsville. The factory was officially dedicated on April 29, 1870 by Elder John Taylor of the LDS Church’s Quorum of the Twelve Apostles. In the highlight of the event, the factory’s 350 spindles were briefly set in motion. The future of the Grantsville Woolen Factory couldn’t have looked brighter. But according to the 1961 publication of the “History of Tooele County” by the Daughters of the Utah Pioneers, the factory operated only 10 months before closing. That’s also when the details get sketchy. Some blamed a scarcity of raw materials for the factory’s failure. Some blamed the muskrats that constantly bored through the dam, hindering water wheel operation. Others, including Forsyth, said parts of the structure were built on quicksand. Each of these factors seems plausible. The “History of Tooele County” notes that pioneer sheep flocks were indeed small and their fleece light. Muskrats still menace the waterway today, and the soil along the entire channel is generally loose. The dam was never rebuilt, and the factory’s machinery was transported to the Provo factory in 1872. Little is documented about the history of the factory after it closed. 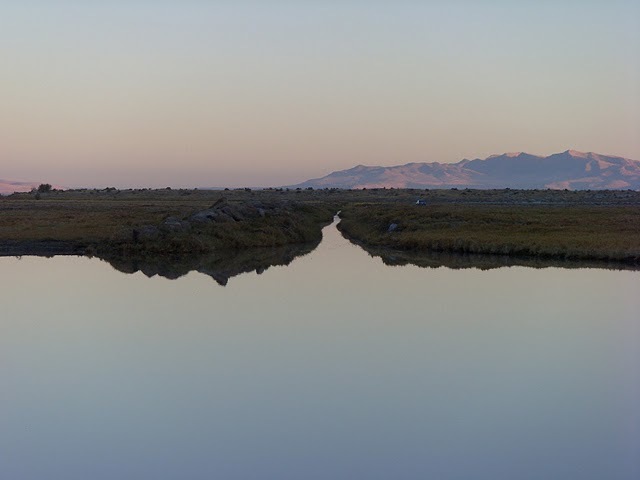 The “History of Tooele County” briefly mentions that the structure was later repurposed as a fishery, a dairy, a factory manufacturing overalls and even apartments. Eventually the structure was completely abandoned. 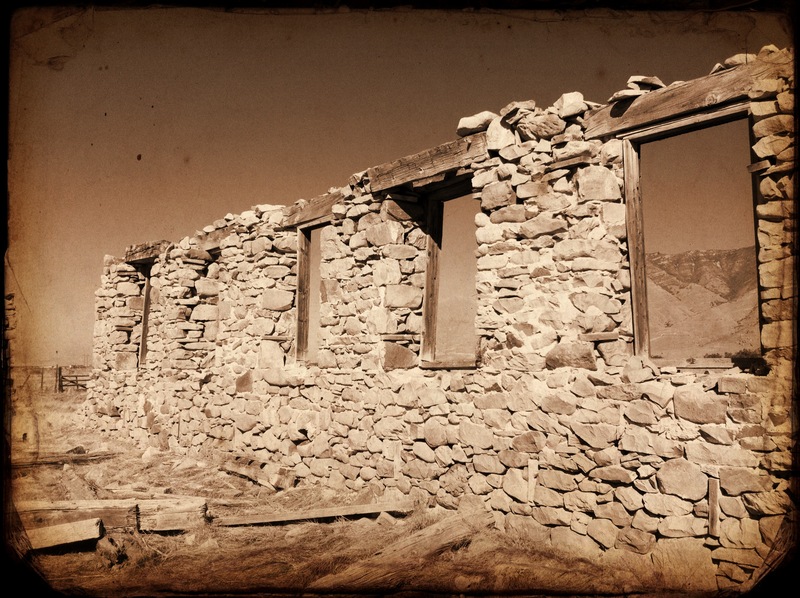 The roof was removed and used to remodel the historical adobe house still standing at Lone Rock Ranch. The wooden columns gave way and the narrower tops of the walls began to crumble. The Forsyth cabin was moved to the Benson Grist Mill complex in 1986, and E.T. City itself was eventually absorbed into Lake Point. The entire area, including the factory, the ranch, and Adobe Rock, is believed to have been acquired by Kennecott Utah Copper in the 1960s, although the exact acquisition date is unknown. Erda resident DeLaun Blake and his wife Wilhelmena said they leased the ranch to Kennecott from approximately that time to the mid-1990s. 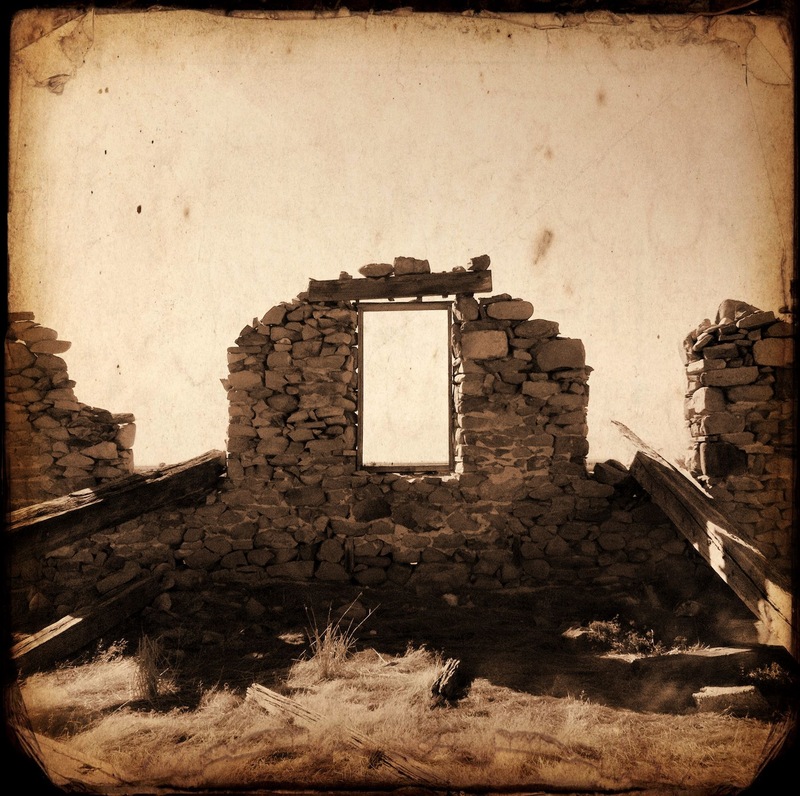 They were the last occupants of the adobe ranch house. Blake, 91, has fond memories of living next to the factory and is still amazed at the design. Blake recalled planting rainbow trout in the springs, lending credence to the creek’s viability as a fishery. Kennecott — now Rio Tinto — continues to lease the land for agricultural purposes. While the company has no specific plans for the factory ruins, Kennecott Asset Manager Jeff Lachowski said the company is mindful of history and is interested in preserving the site. Public access to the ranch and factory site is restricted. However, the restored Forsyth cabin at the Benson Grist Mill is publicly accessible. Large carp have now taken over Adobe Creek. On a clear afternoon last week, dozens of them cruised the shallows on both sides of the broken dam. The factory’s vacuous rectangle was empty, save for the fallen beams. Wooden frames lined many of the glassless windows. Walking along the thick stone perimeter, one laments the factory’s premature demise. Would the factory have continued to operate had the dam not broken? Would it be occupied by some other enterprise? Would there be more of it left? No one will ever know, but one thing is certain. The stately skeleton of the Grantsville Woolen Factory remains a solid testament to Tooele County’s pioneer spirit. Stay tuned next week for a video tour of the ruins. Mention Iosepa and most people think of the modern steel pavilion that dominates the site. For others, the tidy cemetery comes to mind. Few, if any, consider of the large, pear-shaped pond across the highway. That’s too bad, because it’s one part of Iosepa that remains almost perfectly intact—physically and maybe biologically. The following originally appeared, without tangents and nested tangents, in the November 11, 2010 edition of the Tooele Transcript Bulletin. It was still dark when Tyler and I rolled onto the banks of Skull Valley’s Rock Bottom Spring. From here the rutted double track we had been following veered sharply eastward. Our destination, an unassuming pool called Kanaka Lake, was another half mile due south. We’d have to park and hike the last leg, but that was fine by us. What better way to arrive at our favorite Hawaiian ghost town? “Hmm, coats would have been nice,” Tyler quipped when we were met by the frigid, pre-dawn air. Ah yes, coats. Of all the things to forget. I blamed this year’s extra long autumn for the lapse. Note to self: the desert gets very cold at night. The flannel shirt won’t cut it anymore. Tyler, whose light jacket was also not cutting it, made a similar note. At least there was no wind. We hopped a wide ditch and trudged into the darkness, our limbs warmed by movement, our hearts by the prospect of adventure. Tyler and I have spent a lot of time exploring desert places, but we had never seen this outlying corner of Iosepa up close. As far as we were concerned, this was uncharted territory. Though it existed for a brief 28 years, Iosepa occupies a revered spot in Tooele County’s history. Its story of faith and resolve has captured hearts worldwide. The town was settled in 1889 by Hawaiian converts to the LDS Church who had moved from the islands to Utah. Built on a working 1,280 acre ranch purchased by the church, the new colony would become a cultural and economic sanctuary for the Polynesian pioneers. At its peak, 228 people called Iosepa home. The town was abandoned in 1917 when all but one family returned to Hawaii to support a newly announced temple there. The ranch was sold and the buildings were dismantled. The entire town site was later plowed. Today, virtually nothing remains of the town that in 1911 held the designation of “best kept and most progressive city” in Utah. Despite the interest Iosepa generates today, not much is known about day-to-day life there. Not even the remarkably preserved cemetery can tell us much about how these extreme pioneers lived. In 2008, archaeologist Benjamin Pykles and a team of New York anthropology students began an ongoing study of the town site. Regular readers of this column know of my own efforts to help connect the dots of Iosepa’s past. In 2008, Tyler and I located and documented what the old timers called Story Rock, a limestone slab carved with images of palm trees, sea turtles and sharks. I often reflect on those petroglyphs and the Hawaiians that carved them. Who were these people who traded their island home for an unforgiving desert? What were their dreams? How did they spend their spare time? The “lake” is a pooling of one or more geothermal springs and part of the extensive wetland system that spans the length of Skull Valley. Kanaka’s warm, brackish water never freezes and is suitable for livestock drinking. Carp planted by the Hawaiians thrived in its shallows. Modern critics who question the Hawaiians’ choice to settle in such a seemingly inhospitable clime need look no further than Kanaka Lake. The lake was also a recreation hub for the Iosepans. If Salt Mountain was their island, Kanaka Lake was their Pacific. Summer days were spent swimming and basking on its shores. In his 1958 BYU Master’s thesis, Dennis Atkin noted that the Hawaiians caught carp by sneaking up behind the fish, gently stroking them along their sides, then grabbing them by their gills. SIDE NOTE/TANGENT: The notion that the Iosepans ice skated on Kanaka has been perpetuated in several articles through the years. Atkin mentions ice skating in the same section of his thesis that he writes about Kanaka Lake. It’s likely that some lazy writer falsely connected the two and everybody else ran with it. Kanaka Lake is a warm spring. It does not freeze. This is just one more example of myth perpetuated by lazy writers. NESTED TANGENT: There is no documented evidence of the Iosepans ever referring to the lake as “Kanaka Lake.” The term “Kanaka” is Hawaiian for ‘people’ or ‘person.’ Outsiders often referred to the Iosepans as “the Kanakas” and Iosepa was known to most people as “Kanaka Ranch.” It’s likely only the surrounding white settlers called the spring “Kanaka Lake.” If the Hawaiians had an official name for it, it is not known to history. Last July, Professor Pykles and I stood at his dig site and gazed down at Kanaka Lake. Are there still carp in there, we wondered. If so, are they of the same stock planted by the Iosepans? Pykles wouldn’t have time to investigate the lake before he left. Neither would I until fall, but if I could catch a carp, somehow deflesh it, and send its bones to New York, Pykles would see if they match the bones he unearthed during his dig. I secured access from the Ensign Group who now owns the land. The pressure was on. I’m a decent angler until an article depends on it, and then I can’t catch anything. My bad fishing luck has become a running chuckle in the newsroom. The fishing part of this trip, I assured Tyler, was secondary to the actual experience of being where the Iosepans fished and played. “But how hard could it be?” I asked as we approached the misty lake. The atmosphere was surreal. After almost a century without human encounter, surely these fish were up for a glittery ball of Power Bait. We cast in as the sun peeked over Salt Mountain, but Kanaka’s surface was as still as glass. Three hours passed without so much as a nibble. The sun was up; it was t-shirt weather now. Wild and very picky. We moved to the lake’s outlet where massive two-foot carp taunted us by zipping back and forth in water more shallow than they were tall. Our varied baits and techniques were useless here too. But we had answered our first question: there were carp in Kanaka Lake. The second would have to wait. Like other Iosepa-related quests, success rarely comes on the first try. It’s ok. We’re persistent. Those carp can’t run forever.